Maybeline Rebel Bouquet ColorShow Graffiti Nail Polish Unmellow Yellow 809, Price,swatches, review, photos. One thing Maybelline always makes me happy about is that they are always keeping things very interesting with various products and themes! This spring ( or summer since we barely feel spring in India) Maybelline launched the Rebel Bouquet... a riotous collection of colors to make this spring/summer brighter! Last year, the Pink Alert was on and this year, we are going so rebellious with the Rebel Bouquet! yellow 809. I don't know what is yellow about it, but I see black dots and flecks of various sizes along with some mint. I tried it on red, but I feel that it works the best on lighter colors, like white! 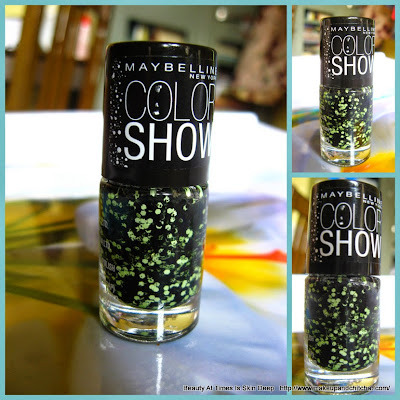 I have worn it on my Colorbar nail Polish called Exclusive and swiped one coating of Maybelline Rebel Bouquet ColorShow Graffiti Nail Polish Unmellow yellow. Not everyone liked, it. But, I like this combination. It's different and fun! There are tons of patterns available and I am particularly looking at this range since people like me who are complete failures with nail arts, can finally do something fun with their nails! 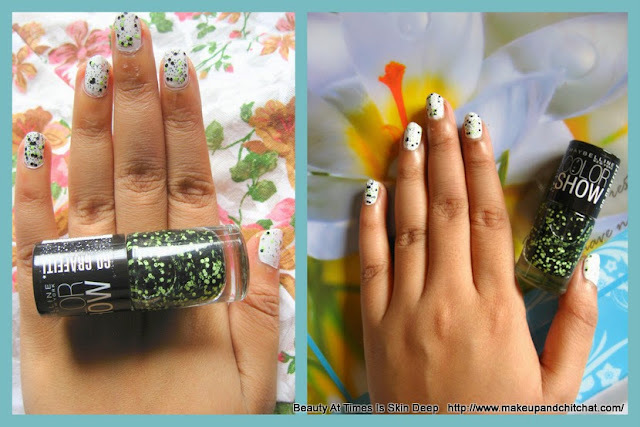 Quirky and fun patterns which makes life easier for those who are not adept with nail arts. Available in lots of patterns. Maybelline products are easily available. Easy on the pocket. 6ml costs 145 INR. The brush is of good quality which makes application easy. The paint dries up in a minute and does not get imprints. The fact that Maybelline is constantly hiking up the price of their products. Do I recommend? Yes! 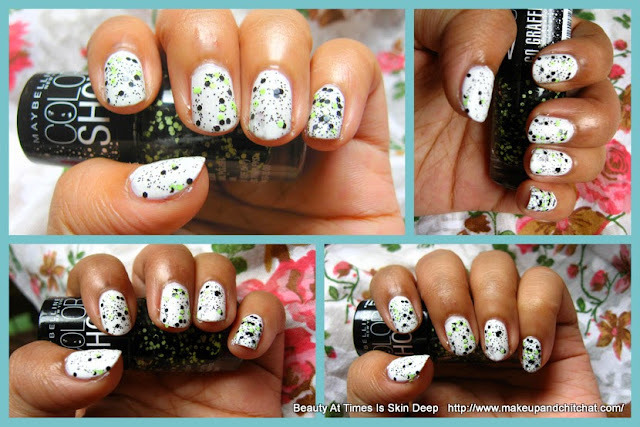 These are really handy to give interesting twists to regular nail polish colors. Shall I repurchase? I won't buy this particular one of course. but, I would definitely look at other variants from this range. What do you think of Maybeline Rebel Bouquet ColorShow Graffiti Nail Polish Unmellow Yellow 809? Have you tried anything from this range yet?